There is almost nothing that costs less than a can of paint or two. Do you remember painting your room or things in your room when you were a teen? I remember that one sister loved rearranging just as much as I did, so we rearranged our room about every two weeks in our teen years. We didn't have a lot, because I had ten siblings, but we were creative. Well, my daughter takes after my side of the family. Have you seen those expensive dress racks? The racks that we admired were in the 200 to 300 dollar range at Ballards and PB, though clothing racks can even be found at Amazon. However, we are big on Ikea here, there are several Ikea hacks on my blog, even in my kitchen, because Ikea can be remade in fun and interesting ways. Well today, we have a simple Ikea hack of a Rigga clothes rack. As you can see, this metal rack is sort of institutional; it reminds me of a hospital rack. But now it is a faux vintage clothes rack. We had our stock numbers in hand to just go into Ikea's warehouse and pick one up for about fifty dollars, but then we decided that we should look at the others that Ikea had available. We decided this rack was the most sturdy of several for 13 dollars! I did not type that wrong. This rack was the least wobbly; the wheels swiveled, and the height was adjustable. and then they spray painted it Rustoleum's metallic gold. They also spray painted a package of Ikea hangers. (The blue side table project is here.) We love their new hangers! Ikea put a notch in them, which keeps dresses on the hanger. She has lots of dresses, because she plays the piano, and this makes every day life neater. We have a small home with little closet space despite putting in organizers. Now, I hope to don't not have dresses hanging from my canopy bed! She has a canopy bed too, but she points out that because hers is curved every thing slides down, (and it does). where the holes are for the adjustable height buttons. It even has a shoe rack, which has solved the problem of four pairs by the front door. The result is spectacular faux vintage look for thirteen dollars and a can of paint. Coming up, we have another affordable Ikea hack. I could also tell you how she made the affordable framed poster if you are interested. You may have noticed that my daughter's bedroom's wall color has changed. When we were in Paris, our hotel room was black. Also, ever since we painted my spouse's office black on her urging, my daughter has wanted to change her room. I know that my spouse told her a year ago or a bit more that he would not paint the room for two years, but a year goes by, so this time she painted all the lower parts of the walls herself, and he helped with the rest. How can you say no to that? You can see her hands on Instagram, but that's from painting a painting. It's counter intuitive, but black paint makes her room brighter in the daytime, because the room receives northern light from only one window. Overall, it is a glamorous look with a cocoon like feel. Until this change, every color she has ever chosen has ended up looking gray. Like I said, I believe that there is also almost nothing more inexpensive and creative than a can of paint in a teen's hand. It's Ralph Lauren's Black Dose. She is not the first to do a black bedroom. They can be found in the PB catalogue, Anthro, and on Pinterest. But here is another dramatic one at Trois Petites Filles. You are so very right - there is nothing as effective, quick and thrifty as paint. The vintage-style rack is a very good hack!....and it looks oh-so-pretty with that party dress hanging on it. Very stylish. I had one of those clothes racks for ages when I was a starving student, because I moved around a lot and you never knew when a flat would have a wardrobe or not. They're very convenient, but your dd's is lovely and snazzy. I like her black wall too. It turned out so beautiful. I agree with Sarah. It is very stylish and so beautiful. My Eva would love to have this in her room. I love this project so much! Great idea and yes, very stylish! What a creative idea...I just love it! The gold paint changes the whole look of it. Fabulous! What a clever hack--instant glam added with paint and I love it! Because of having a shop - I have had many of these and I think what she did was amazing! Very creative Daughter - like Mother of course! Love it and the color! Great job! Very clever girl! Wonder where she gets it! Great job. Fabulous! So very chic with that beautiful dress hanging on the gold hanger. Your daughter has great style. I laughed as I read about you changing your room as a teen. My sister and I did the same. It drove our parents nuts. They had furniture built for specific spots in the room, but we were always moving them around. The idea for the clothes rack is great! Love the dark walls also. Hi Su can I say WOW 10 siblings I had no idea! As a kid I too was always rearranging, designing and painting... The childhood stories of creative minds. 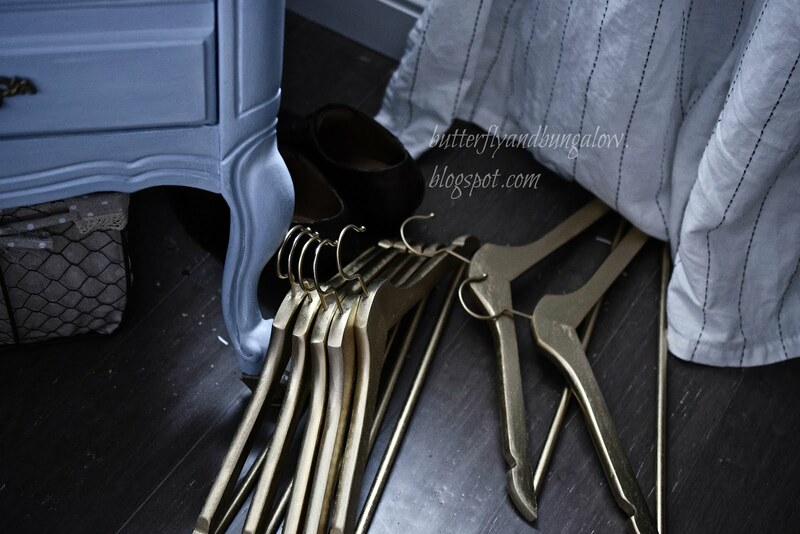 That's a great IKEA hack and the Gold sprayed hangers add luxe galore. Since I'm one who loves the moody and dramatic I adore Black walls. Loving the changes. Delightful post. Paint is one of those inexpensive things that makes such a world of difference. Thanks for stopping by my place and for the kind words. I love the gold. What a fun idea. A friend of mine had a black bedroom. It was fun and well decorated with reds. The black sounds very dramatic and dreamy! Love the gold rack. 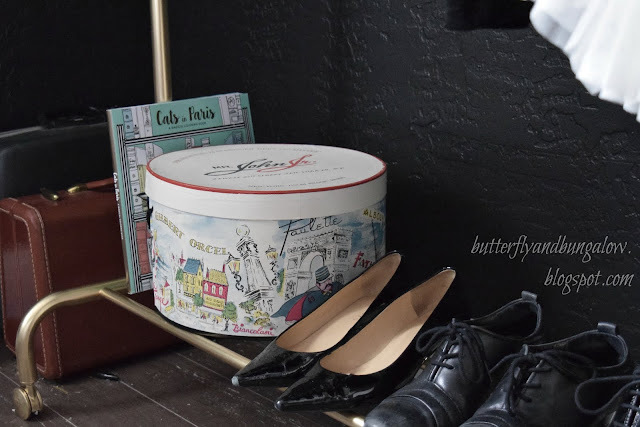 What a simple way to personalize it and add a vintage flair! WOW, it looks terrific. You would never know that it is only $13.00. I love all the hangers and the changes your daughter made. I think she takes after her mother. It looks very chic for a price you can't beat! It was always drunk to come up with creative privacy spaces. It's been so long, many years for me with a visit to an IKEA store, I do remember loving the bargins and the market goods. I so need to make a visit soon. I have always wanted a clothing rack like the ones we see at a trendy clothing boutique, the ones that were made out of industrial pipes, with the plumbing joints and a 2x4 base with industrial wheels. Giving it that feeling ai live in a New York warehouse or flat. Enjoy the racks, I am looking forward to your next creative post. 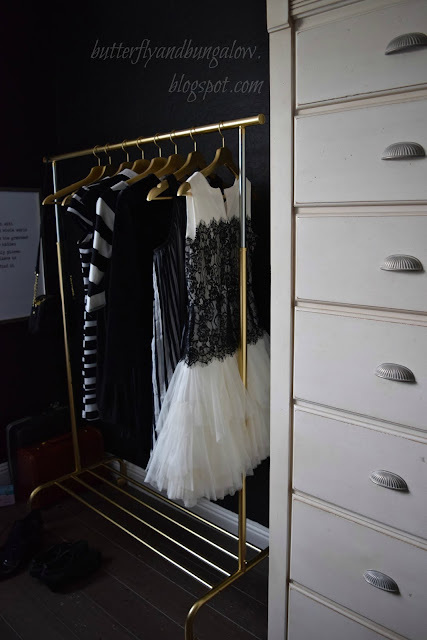 The clothes rack looks very glamorous, especially with the fun dress hanging on it. Great idea to paint the hangers as well. A Paris-inspired black room sounds very chic. The clothes rack is beautiful. Very elegant. And the gold hangers make it all the more special. My son once had a half black room with two opposing walls black and the other two white. There is only one window and like yoaur daughter's room mentioned in the post even with that much black it was not dark. Today that same room is a dark chocolate brown, another dark color that does not seem to make the room dark. This post will inspire many!!!! Thanks for sharing. Beautiful! I can picture a rack like that full of clothes being rolled across a busy New York City street in the clothing district. Lots of people, lots of trucks making deliveries, and several racks of clothes. Fun post! I love how your coat rack has been transformed. So elegant and chic and fun to style! Love the results and I need to check out those Ikea hangers! I have a rack very similar in our furnace room that belongs to our youngest daughter. Never thought of giving it a makeover, but what a great idea! Your daughter is so creative. The rack and hangers look wonderful. When my youngest daughter Grace still lived at home she painted all of her vintage furniture black and she had a black iron bed. Her walls were a pale sea blue. It looked really good. I don't know what it is but most teenagers want black rooms. Now that she is away at University her apartment is decorated in all natural woods with copper accents along with the green Grandpa chair from Ikea. She lives in the redwoods near the sea and is majoring in Wildlife Biology so it suites her. Thank you for your visits and comments dear Su. I love that you were from such a large family. I love the rack and hangers Su and just perfect for your daughter to use! These work only for display, not for daily use. I had some in the store and after a while of customers pushing clothes back and forth they were like The Leaning Tower of Pisa. 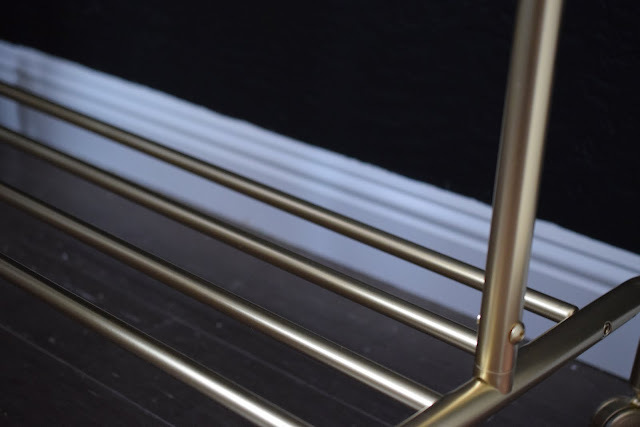 Does the gold paint start to scrape off from the sliding back and forth of the metal hangers?? No, but she only displays fancy dresses.